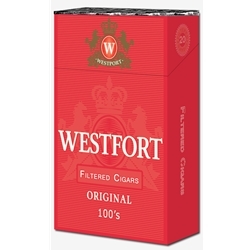 Westfort Full Flavor Filtered Cigars are available in Box 100's and packaged 20 cigars per pack, 10 packs to a carton for a total of 200 premium filtered cigars. Westfort offers a variety of styles and flavors for you to choose from. Menthol for a refreshing mint flavor, full flavor for a robust taste of tobacco and wrapping, and light if you prefer a less full bodied smoking experience. No matter your flavor preference, Westfort Filtered Cigars are designed for you to enjoy a cigar with a smooth draw, quickly and conveniently.